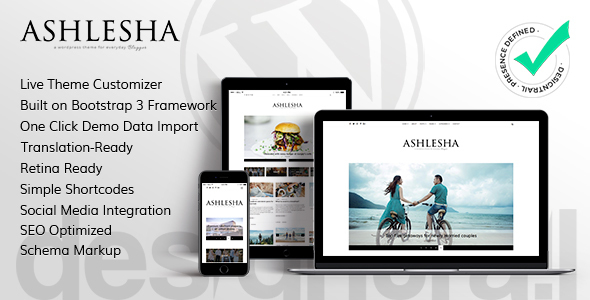 Ashlesha is a Modern & Simple WordPress Blog Theme. Perfectly suitable for beginner, personal & experienced blogger as well as small businesses. With the WordPress Live Customizer add your own logo, your own content and pages, change colors & more. Schema.org Markups to improve SEO results. This makes your content not just visible, but also â€œunderstandableâ€ to search engine bots. â€œShareâ€ buttons at the bottom of post and Pinterest Pin It button on postâ€™s featured image hover empowers you and your visitors to advertise your website. In addition to predefined sidebars via theme any plugin like â€˜woosidebars can be used for unlimited sidebars.